On February 17, 1972, President Richard Nixon departed for his historic visit to China, paving the way for the transformation of relations between the United States and China that continue to this day. The President stated then, "As we look to the future, we must recognize that the government of the People's Republic of China and the Government of the United States have had great differences. We will have differences in the future. But what we must do is to find a way to see that we can have differences without being enemies in war." If the President of the United States can apply such a rationale then, why can't it applied now? One day after that historic anniversary, we look to the United States Cuba relationship, or the lack thereof, and ask, when will President Obama seize the historic opportunity as well? When will the President go to Havana and bring an end to a very dark chapter of United States and Cuba relations? Unfortunately, the reality of the state of our relations with Cuba remains in the stalemate of fifty years. As we have published in prior postings, the outlook for change in U.S. Cuba policy does not look good in this Congress. Remember, to change U.S. Cuba policy, several Acts of Congress will be required to pass. There is a well ensconced pro-embargo/anti-travel Cuba firewall of Members of Congress in the House and Senate that will block any legislation or even permit debate on the subject. For more than ten years, that firewall has yet to be challenged politically by the pro-engagement/pro-travel side. There may be a few holes in that firewall though. It is said that "arrogance and ignorance are the downfall of men and nations." So too that adage appears to apply to many of the Cuban American hardliners in this new Congress. Allegations facing Senator Bob Menendez (D-NJ), Chairman of the U.S. Senate Foreign Relations Committee, have him crossing ethical lines of behavior if not also legal ones, though still remain to be proven. Rep. Albio Sires (D-NJ), the House Foreign Affairs Western Hemisphere Subcommittee Ranking Member displayed his intelligence when he accused Cuba of being responsible for the political scandal currently facing Sen. Menendez. Senator Marco Rubio (R-Fl) began to display his true colors in his Republican Response to the State of the Union Address. His performance was nothing more than a charismatic used car salesman trying to sell the public another lemon of old and failed ideas. Senator Ted Cruz (R-Tx), with prosecutorial zeal, positioned himself as another would be Joseph McCarthy. His behavior against Defense Secretary Nominee and former Senator, Chuck Hagel, turned Senate traditions and protocols upside down. Sen. Cruz also appears to suffer from the same foot in mouth disease when discussing his Cuban immigrant origins like Sen. Rubio did, exaggerating the circumstances for his elders' immigrant journey to the United States. President Obama does have the authority to make it easier to engage Cuba, yet there is still the lack of a persuasive political argument to move such an agenda forward. What is the case to get the President to act on Cuba now? Who is talking to and briefing the President on Cuba? Where are the votes to support or elect a politician who will change the policy? Where is the money being raised for such candidates? To the contrary, there appears to be hesitation or fear of negotiation to resolve long standing issues with Cuba. More importantly, the lives of Alan Gross and the Cuban Five still remain tangled in the U.S. Cuba web. The President can also remove Cuba from the list of State Sponsors of Terror, a designation that Cuba, despite our political differences, factually does not deserve. However, its removal from that list will not be driven by a petition. It will be driven by politics. While President Obama as candidate Obama, correctly assessed our policy with Cuba as a "miserable failure", he quickly was reached politically by the hardliners to modify his position. The President had dinner with Miami hardliners in 2010 and raised two million dollars for the DNC. While those hardliners do not care for Democrats, they covered the political bases because they know how the game is played in Washington DC. Unfortunately, the President does not see the opportunity yet or have the urgency to change our relations with Cuba now. Recently on Telemundo, he was interviewed by Jose Diaz-Balart, the brother to embargo hardliner Congressman Mario Diaz-Balart (R-Fl). The President was basically noncommittal and nonspecific about doing anything more on Cuba. While Jose Diaz-Balart is an excellent and Emmy award winning broadcaster, he is also related to Fidel Castro. Did the President know he was being interviewed by Fidel Castro's nephew? The Diaz-Balarts' father and Batista strongman, Rafael, is the brother of Fidel Castro's first wife, Mirta. Fidel Castro's first son, Fidel Castro Diaz-Balart, is the first cousin to the Diaz Balarts. That is another aspect to the whole U.S. Cuba relations debate that seems to go unnoticed, the family and or political ties to the Castro family or Castro's predecessor, Cuban dictator Fulgencio Batista. Does the U.S. taxpayer and U.S. foreign policy really need to be caught up in a long standing family feud? Very shortly, moderate Cuban Americans and other Americans will be making the rounds to Washington DC to educate members of Congress on their thoughts and views about U.S. Cuba policy. 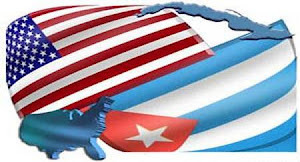 Their efforts should be commended as there is an ignorant perception that the Cuban American community is monolithic in their views about U.S. Cuba policy. Once again they will make intelligent arguments that the embargo, travel restrictions, and sanctions do not work and need to end. They will point out that even well known Cuban dissidents like Yoani Sanchez do not support our policies against Cuba. They will state their hopes for better days and changes in Cuba's politics, but not through the interference of our policies. Then they will be asked by some Members of Congress, why do your brethren who do not agree with you either vote for me or support my election campaign? What are you going to do beyond just telling us how you feel about these issues? Where are the votes to end the embargo or the travel restrictions? Not to mention, when is Alan Gross going to be freed? May the answers to these questions empower the community's commitment to change. did to our people. As far as I am concerned. The Embargo should stay in place until Castro is gone and there is a free elections in Cuba. Where is it required that the United States engage in this policy when there are no free elections in Saudi Arabia, China, Bahrain, Vietnam, and other countries where we have normal relations, travel, and no embargo? What Castro did or did not do to the Cuban people is a matter between Cubans, not Americans. Cubans will decide when there will be political changes in their country, not us. We should not be hypocrites as a country with the rest of the world when the United Nations consistently reminds us annually to end the embargo. Is Cuba pointing missiles at or threatening the United States today? The embargo hurts everybody but Castro and is making certain people and interests rich. There is the issue of compensation for expropriated American properties. However, how can there be compensation when there is an embargo? While I agree with you that there should be free elections in Cuba (one party elections are not democratic) and across the globe, we have enough problems here in the United States with our own elections. How many citizens waited hours standing in line to vote in Florida and other states in the last election? We have to have the Justice Department intervene in some states under the Voting Rights Act to make sure people are allowed to vote and not discriminated against. You have to be a millionaire or raise millions of dollars to run for Congress. We have two political parties that dominate and control the political process. We have a lot of problems with our "free" elections here. Anonymous, you don't know how sorry I am for all the pain that Cubans have suffered through their entire history of liberation. The pain is still alive and nothing, not even apologies, will be able erase it. But be mindful that the embargo itself was devised to continue the suffering of the Cuban people, as that suffering was deemed necessary for them to rebel against their government. The embargo has been successful in one of its goals, that of continuing the cruel crushing of the Cuban people. But, contrary to what it was intended to do, it has reinforced the powers in place. It has forced this government and its population to be on a continuous war footing, with the consequences that we know for civil life on the island. This government has now 5 more years under the leadership of Raul Castro. It will continue revitalizing its image and its economy by engaging Europe, Canada, CELAC, and some countries in the Middle East. The embargo is succeeding in making the U.S. irrelevant to the Cuban reality. The U.S. government and Cuban-Americans that have refused any engagement with Cuba are losing the opportunity to have any say in the future of the island. Reach out, visit the island, engage the people who live there. You will find out that they will respond in kind. They are not your enemy. They are your own people.